Ogoh-ogoh 2013, the parade this year, in celebration of Nyepi, 2013, took place on March 11, 2013. Ogoh-ogoh 2013 parade this year heavy rain is likely to occur, because up to now in Bali frequent heavy rains. Thus, in the manufacture of ogoh-ogoh, should be done in a firm, protected from the rain, so ogoh-ogoh is not broken, before the stage in a parade of ogoh-ogoh in March next. 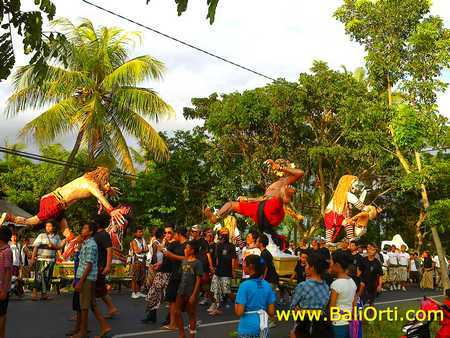 Parade of ogoh-ogoh in Bali this year will take place on March 11, 2013. Simultaneously throughout Bali. As has been ongoing since hundreds of years ago, ogoh-ogoh parade took place before the celebration of Nyepi. The Balinese often call the "Tilem Kesanga". "Tilem Kesanga" is a day, from the day before Nyepi. It is a calendar, based on the Balinese calendar. Today it is the end of the year according to the Balinese calendar calculations. Almost the same as other types of calendars. As held by the Chinese. And Nyepi is the last day of the year. Ogoh-ogoh is a symbol of evil. The Balinese make ogoh-ogoh, then endured together by many people and paraded around the village. Ogoh-ogoh are made with a very large size by a group of youths. Usually made ​​with a form and manner that is very creepy. Which is a symbol of evil to be eliminated from the human self. Ogoh-ogoh parade this year seems to be very festive. But also happens to be a tense and hot atmospheric between youth groups. Because in Bali gubernatorial election will take place. Bali governor that will lead up to five years. Normally, the parade ogoh-ogoh will serve as a platform for the campaign of gubernatorial candidate who will compete to lure people. Not uncommon in funding the manufacture of ogoh-ogoh, donated by supporters of a candidate for governor. There are other concerns felt by ogoh-ogoh makers, rain. Rain is likely to occur in the month of March. Because the rainy season in Bali has not been completed to date. Fears and concerns about the rain is going to happen in March next perceived by ogoh-ogoh makers. Because rain which flushed the parade ogoh-ogoh, will damage the sculptures of ogoh-ogoh being paraded around the village. The damage will occur in the very face of ogoh-ogoh made of paper. Ogoh-ogoh are made ​​of sponge, it will absorb water, which can cause ogoh-ogoh become increasingly heavy for carry. So whatever happens next, the parade took place, I suggest you come to watch the parade of ogoh-ogoh. For parade ogoh-ogoh is unique activities undertaken by the Balinese, who has been going every year, since hundreds of years ago in Bali. Come take part in ogoh-ogoh parade. You can contribute to the making of ogoh-ogoh, in return you will be given the opportunity to become members of the ogoh-ogoh parade.